Incremental timer allows precise monitoring of holding period. •Four-hour digital indicator displays in 1-minute increments. •Volume indicator displays how much coffee is left inside the server. 1-year lifespan. Display shows low battery symbol when replacement is needed. •Vacuum insulated to keep coffee hot for hours. •Contemporary styling and wrap program for maximum merchandising. •Built-in drip tray attached to the server for transportation—easily removed for cleaning. 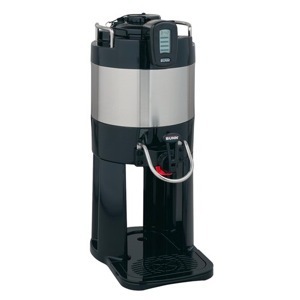 •Large cup clearance allows for dispensing into cups, decanters and thermal carafes. 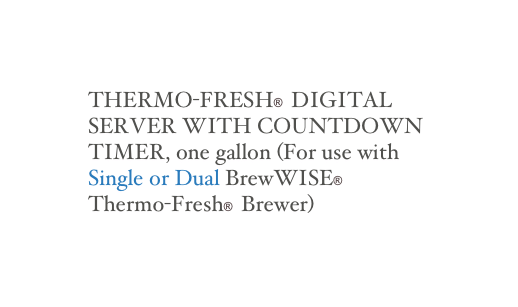 •Ideal for 1 and 1.5 gallon TF Digital Servers use with Single or Dual TF DBC Brewers. Click here for Single TF or Dual TF DBC Brewers.